What Kind Of Life Insurance Do I Need? | Term, Permanent, or Both? What Kind Of Life Insurance Do I Need? Permanent, Temporary, or Both? 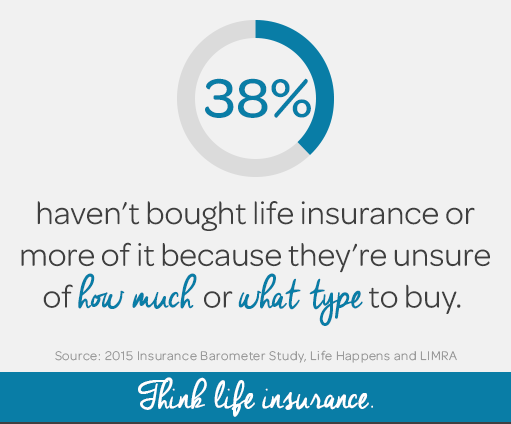 Knowing what kind of life insurance you need is probably the most important part of getting insured. Do you need term insurance or permanent insurance, or both? How long does your insurance need to last? The answer to these questions depends on the purpose of your life insurance. Up to now, we have only talked about the death benefit and protecting against the loss of income from a death. There are additional benefits that life insurance can provide. We’ll cover these along with showing how life insurance is a key part of your financial plans, and give you a model of how life insurance can be used through-out your living years, and how long it should last. Finally, you’ll get our insurance planning tool which will help you determine what type of life insurance you need. What Is The Purpose For Your Life Insurance? For most people, the primary purpose of getting life insurance is to protect against the financial loss of a spouse or partner. This is why life policies were created in the first place. Another benefit life insurance plans can provide is to enable you to use the death benefit to pay for the cost of providing long-term care services. This is typically done using a LTC rider on the life insurance policy. Long-Term Care (LTC) expenses continue to increase and the only way to protect against the need for these expenses is by using LTC insurance, annuities with LTC riders, or life insurance with LTC riders. In a life insurance policy with a LTC rider, the insurance company already knows it will pay the death benefit, so the ability to withdraw the death benefit to pay for LTC expenses typically only adds a small cost to the premiums. These LTC riders are beginning to be a popular source of protection against LTC expenses. Permanent policies can also provide a method of growing a tax-free cash value inside the policy. This cash value can be withdrawn from the policy as a source of income or for emergency money. Once you have filled up the retirement account contributions in each year (IRAs, Roth IRAs, 401k, Simple, SEP IRA), extra savings can be directed towards cash value permanent insurance to grow your tax-free retirement funds. The last benefit that life insurance can provide is for estate planning or legacy planning. In estate planning, life insurance is used to provide money to pay the federal and state estate taxes when you pass away. The estate tax laws have changed such that unless your estate is valued at over $5,000,000, you will not have to worry about estate taxes. 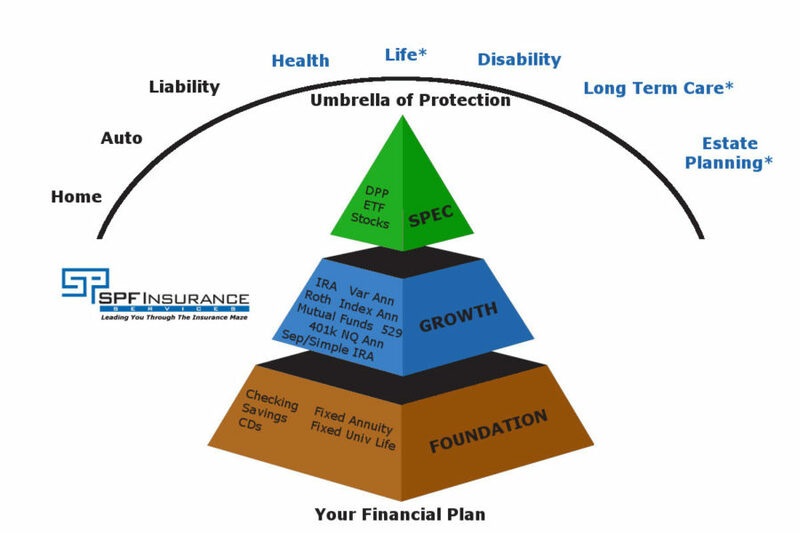 At SPF Insurance, we view life insurance as a key part of your financial plan. All the planning and preparation will be worthless if something unexpected happens and derails your plan. Life insurance is a key part of the umbrella of protection that your family needs. For more information about financial plans, contact our office. What Type Of Life Insurance Do You Need At Every Stage Of Your Life? Throughout most of your life you will probably need life insurance. If you are not sure about that, see this page to hear why it is a good idea. What we’ve been trying to determine on this page is what type of life insurance you need. 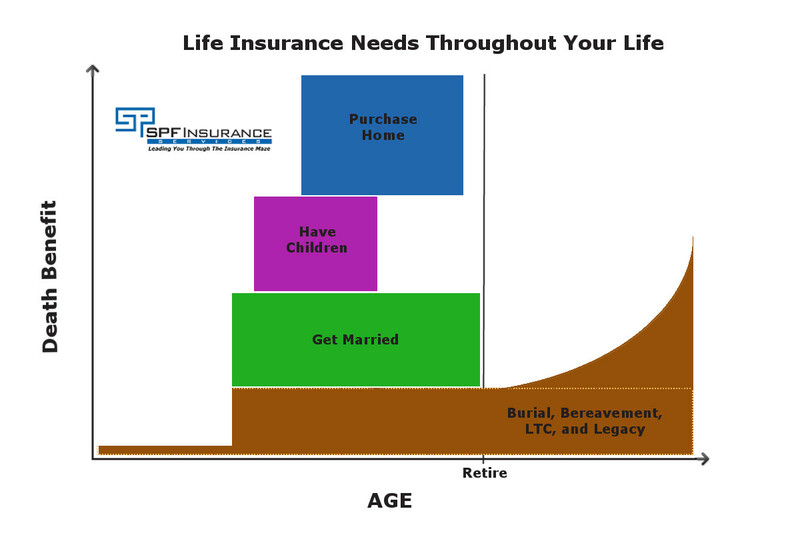 The graphic below is our model of how life insurance should be set up for the average person. As a child, your need for life insurance is minimal. If something happened to you, your parents will pay for your funeral, or they could take out a small policy on you to provide monies for a funeral. Once you are independent, your need for life insurance will have several focus points in time. These life changing events are good times to review your insurance coverage. Getting married, means that you and your spouse are legally bound and your “single” lives and debts are now equally shared. Having protection to provide for each other becomes important. This coverage should last until you are both ready to retire. Having a baby is another life changing event. Besides the complete shift in your lifestyle, you now have long term financial commitments to provide for your child’s (or children’s) well-being and future. If either of you is gone, those financial commitments may be difficult to maintain. For children, you typically need this coverage until they leave school, so 20 to 25 years is the right period of time. Buying a home is typically the biggest investment you will make. The loss of income, due to disability or an unexpected death, may make keeping the home impossible and result in the remaining family members having to move. Home protection should last until you’ve paid off your mortgage. This typically 30 years. As shown in the diagram, getting married, having a baby, and buying a home are best protected by getting a term life insurance policy. As these events occur you can add additional term policies, or replace an existing policy with a larger (or smaller) policy. Later in life, if you have been following a financial plan, you will retire and the need for a large life insurance policy will be reduced. However, you will need to able to protect against potential long-term care needs, and you may want to provide a legacy for your children/grand-children, or provide monies to take care of estate taxes. These types of needs can be provided by a permanent policy. Once your children are independent and your household cash flow has increased, you can begin increasing the amount you put into your permanent policy to increase the death benefit and LTC benefits. For more information about how to do this, please contact one of our SPF Insurance advisors. Use our life insurance planning tool below to determine what type of life insurance you need. This tools asks you a series of questions and then provides a detailed recommendation about what to use for your life insurance needs. Now that you know what type of life insurance you need, you are ready to take the next step and determine what health rating you will get if you apply for life insurance. Most term policies are going to last for 10 to 30 years. The length of time depends on how long the protection is needed. For a home it should be a 30 year term policy. For children it should be 20-25 years. For a marriage it should last until you are ready to retire. At retirement you will have enough money to allow both of you to live comfortably, so there is no need for income replacement life insurance. There may be a need for LTC or legacy insurance instead. Here are five steps to follow when buying life insurance.